Amanpour. 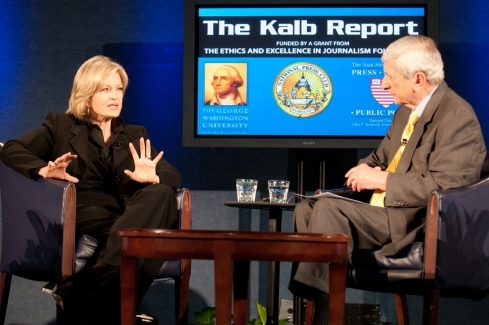 In this program from 2011, Marvin Kalb engages Diane Sawyer, the anchor of ABC World News. 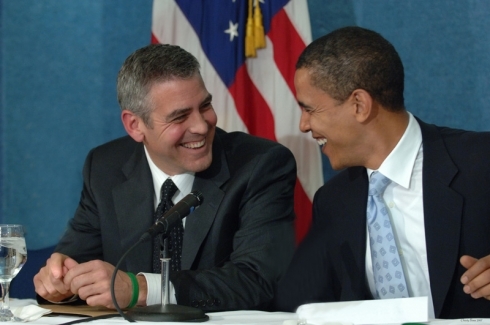 Sen. Barack Obama and actor George Clooney participated in a “Newsmaker” panel discussion (April 27, 2006) on human rights abuses in Darfur, Sudan. The Broadcast Operations Center opened in 2006 to enhance the Club’s revenues and media services. 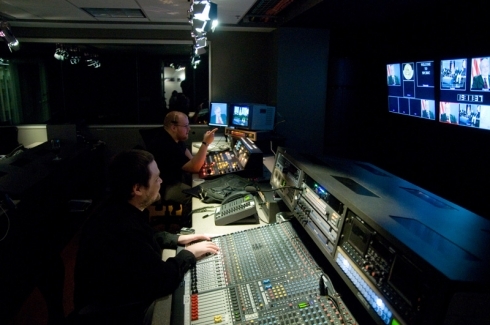 In this photograph, broadcast engineers Ryan Dillenbeck and Jon Linnell (foreground) man technical direction and audio stations in the control room during a webcast in 2008. At a luncheon on Sept. 24, 2007, Iranian President Mahmoud Ahmadinejad spoke and took questions in New York by video link. As head of a country which does not have diplomatic relations with the United States, Ahmadinejad was not permitted to visit Washington. So Club president Jerry Zremski negotiated a two-way satellite hook-up during the controversial leader’s scheduled appearance at the U.N. This was a technological first for the National Press Club. Seated at the head table are (left to right) Jerry Zremski, Professor Kaveh Afrashiabi of Bentley College, Clarence Page of the Chicago Tribune, Donna Leinwand of USA Today, Hiroki Sugita of the Kyoda News Agency and Ken Mellgren of the Associated Press. In 2008, the National Press Club celebrated the 100th anniversary of its founding. To mark the occasion, the Club for the first time extended its programs outside of Washington, D.C., sending Gil Klein (1994 NPC president) to moderate 40 panel discussions in 35 states. The NPC Centennial Forum attracted leading journalists at each site and focused on the First Amendment, freedom of the press, and news industry trends. 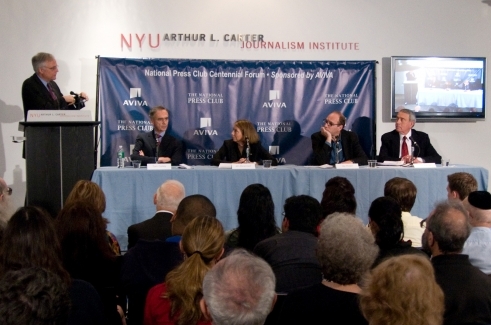 In this program held at New York University, Klein moderated a forum on the future of journalism with (left to right) Tom Curley, president and CEO of the Associated Press; Jill Abramson, managing editor of The New York Times; Jay Rosen, media critic and professor of journalism at NYU, and Dan Rather, former news anchor of the CBS Evening News. Specific topics included the decline of print and network news, the rise of bloggers, and differences in media coverage between the 2008 presidential election campaigns and previous election years.